← Real chocolate jimmies, at last! This one is worth re-visiting….yum! I am a Pinterest recipe stalker, and this was my latest obsession. It looked and sounded so good, I had to make it. I could have eaten the whole batch, but instead I brought it to the office. Everyone loved it, and I was asked for the recipe several times. The ingredients list is short, and inexpensive. The total time is about an hour, and the result is delicious! The stealth ingredient that makes this amazing is the simple saltine. It will make great gifts for the holidays, or bring it to a potluck, and be the belle of the buffet. 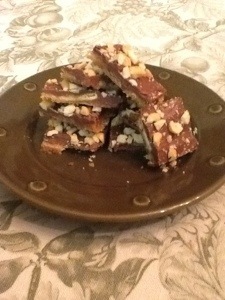 The recipe that I used is from the blog sixsistersstuff. I tweaked it very little and I really think I have a new favorite. I hope you try it soon.